CompStak is Live in Washington D.C.! Looking for lease comps in D.C.? 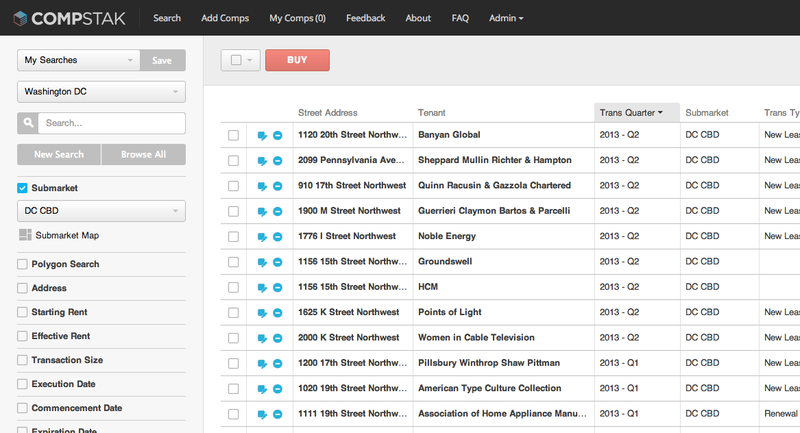 Good news: CompStak has officially launched in D.C. (and the greater D.C. area) today. We are so thankful for the support we've already received in the D.C. community, and we hope you will find the CompStak database useful. Want to make sure we have comps in your area? Convinced and need some comps now? We understand. Click here to sign up and start searching today! Great! Hope you love it as much as we do. You might not see as many points as you think you've earned in your account - but have no fear! We're still processing comps and updating accounts. Your point tally will continue to be updated (up!) over the course of the next week.